Solve problems with your Linksys EA3500 by performing a hard reset on the device. This tutorial provides you with easy steps. If you just want to restart the router, you can do it one of two ways. Press and release the tiny red “Reset” button located on the rear of the router. You will need to use a pen or paper clip to press the button. Select the “Troubleshooting” link on the left side. Wait about 5 minutes for the router to restart. 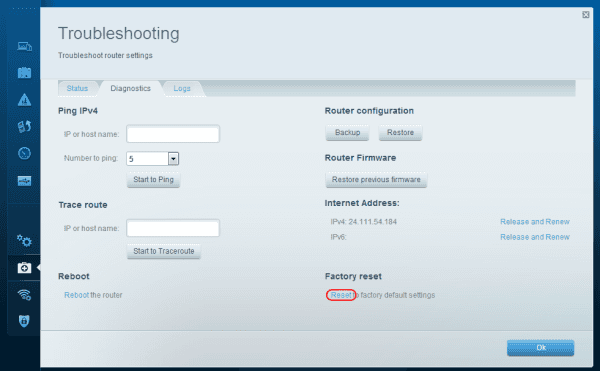 A hard reset will set the Linksys EA3500 to factory default settings. This will clear all settings from the device. Like the soft reset, you can perform a hard reset one of two ways. 1. Press and hold the tiny red Reset button located on the rear of the router for about 20 seconds. The lights on the device should all flash simultaneously, then you’ll know the device has been reset. A warning dialog will appear. Select “Yes” to proceed with the factory hard reset.